Note: Setting this option is only required for VIDEO4s with internal. battery option. You can configure the amount of time to supply the power for the unit using the internal battery backup, when external power is lost. 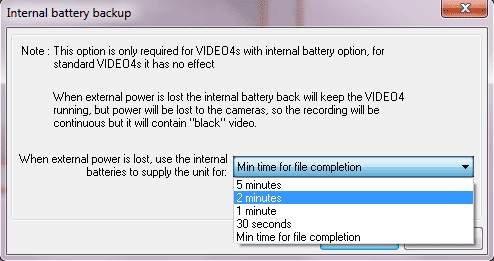 To open the dialog, click �Configuration� -> �Internal Battery backup"Data Configuration�' menu item.